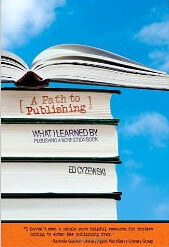 Today we’re reviewing, discussing, and giving away A Path to Publishing: What I Learned by Publishing a Nonfiction Book by Ed Cyzewski. Keep reading to learn how you can win a free copy. In A Path to Publishing, Ed Cyzewski provides authors with a guide through the entire publishing processes from writing to contacting an agent to drafting a proposal to marketing the book. It also compares the pros and cons of having a publishing company publish a book versus self-publishing. The publishing industry is going through radical changes right now. When publishers are considering new authors, they give a lot of weight to an author’s platform – how many people read their blog and follow them on Twitter and Facebook. They do this because an author who already has a following online will probably sell more books and probably do a better job of marketing their book once it’s publishing. A Path to Publishing provides insight into building a platform before submitting a proposal as well as marketing a book online after it’s published. Since I’ve never published a book, I can’t speak to the quality or accuracy of the advice provided in A Path to Publishing concerning writing a query letter, book proposal or the book itself. But as the CEO of a company that provides online marketing services and as a blogger who has participated in a number of blog tours for books, I was very impressed with the insight into how an author can market their book online contained in A Path to Publishing. Right up front in the first chapter, Ed comes out and says, “Writing the book is only half of the work in publishing. Marketing it makes up the other half.” Then he goes on to explain both the value and how-to’s of blogging, blog tours, Facebook, Twitter, podcasts, and more. In recent years, prominent bloggers like Darren Rowse and Chris Brogan have gotten book deals. So have well known Christian bloggers like Anne Jackson and John Acuff. Other authors like Pete Willson, Dave Ferguson, Kem Meyer, and Tony Morgan work in full-time ministry, and they also write great blogs and have prominent social media presences, which has made them stand out to publishing companies and helped them sell their books. If you are an author – published or aspiring – you can’t afford to ignore blogging and social media, and you can’t afford to miss the insight Ed provides into building your platform and marketing your book. I especially like the fact that Ed wraps up each chapter with specific action steps. It really makes A Path to Publishing a great resource for authors to keep handy throughout the publishing process. Do you agree with Ed’s claim that “Writing the book is only half of the work in publishing. Marketing it makes up the other half.” Why or why not? If you’re a published author, editor, agent, or publisher, what advice would you give to an author aspiring to be published? If you could ask Ed one question about publishing a book, what would it be? On Thursday, I’ll be interviewing Ed. In the interview, I’ll ask him as many of your questions as I can. Then I’ll publish that interview here on Friday. Post a comment that includes either a question for Ed or advice for authors (include your Facebook or Twitter usename in your comment so I can connect your comment to your share/tweet). Three people will be selected the afternoon of Wednesday 6/30 to receive free e-books. To get a hard copy, buy A Path to Publishing here (affiliate link).